"Any Trouble are a British rock band, originating from Crewe, England, best known for the early 1980s recordings. Founding members were Clive Gregson, Chris Parks and Tom Jackson. Soon after, Mel Harley and Phil Barnes completed the line up. After Tom Jackson left, the band was fronted by Clive Gregson. The remaining four were the first Any Trouble line-up to record. 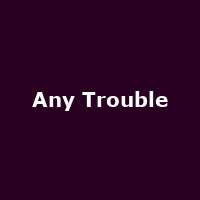 In 2007, following the re-release of several Any Trouble albums on CD, Clive Gregson, Chris Parks and Martin Hughes, plus Mark Griffiths on bass, re-formed to record a new album which was released on the reborn Stiff Records label. The album was titled Life in Reverse and featured thirteen new Gregson songs. It was produced by John Wood, and had unique artwork by the Stiff Records designer Tobbe Stuhre. The band played a reunion gig at the Jazz Cafe in London to celebrate the release. Cherry Red Records released "The Complete Stiff Recordings" in 2013. The band are reformed in 2014.